In this DASH Magazine feature, Melissa discuses how she learned to bridge the gap between “kid food” and “adult food” and serve one meal the whole family can eat together. She tries to get rid of the barrier by meeting her daughters where they are, not just where she wants them to be. By getting her daughters to accept her into their world, Melissa is able to guide them slowly into hers. She shares some of her most helpful strategies to make a meal that is both kid- and parent-friendly, including her secret weapon: a toppings bar with nutritional options to accompany a kid’s classic like mac and cheese. Here is an except from the story. 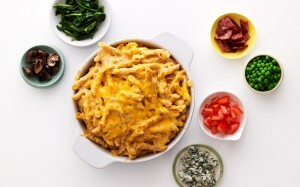 And here is the recipe for Melissa’s Family-Friendly Mac and Cheese with Toppings Bar. Click here to check out all Melissa’s stories in DASH.